Straightens or curls in just 1 stroke. 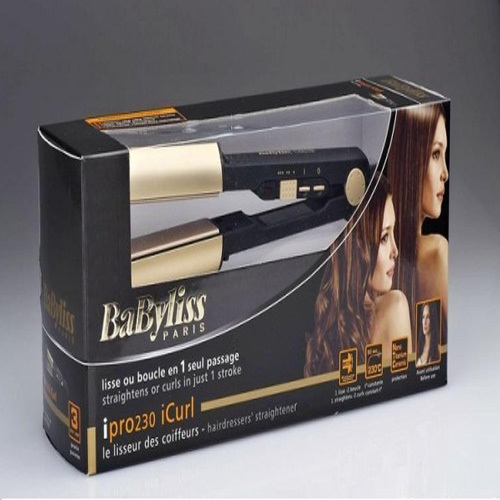 230°C is the temperature recommended by BaByliss to straighten perfectly, even the most difficult to style hair. Professional-use, high density Ceramic coating applied using an exclusive nano-technology procedure: harder and smoother than a classical Ceramic coating. Its ability to glide and to transmit heat softens, shines and protects. Adapted for dyes and styling products. Features: 1. Advanced Ceramics for 30 2nd heat up and maintains constant considerable heat among sections 2. 10 temperatures settings - 150 to 230 degrees Celsius 3. Tourmaline-Ceramic plates for just about any significant shine finish Competitive Advantages Well and High Quality Control.